In honor of the creation debate last night I thought I’d share a piece I wrote not too long ago about the Bible…and dinosaurs…but mainly the Bible. I’ve never written on dinos before, and I thought it would make for an interesting experience. 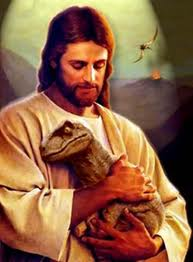 Oddly enough, one of the most frequently asked questions about the Bible is about how dinosaurs fit into the picture. This brings up a whole bevy (I’ve never actually used that word before today!) of arguments from Christians, scholars, scientists, and everyone in-between. Here’s my take on it. I believe that the Bible is the inspired Word of God. I believe that it is how God has revealed himself and his will to humanity. I believe the Bible is supposed to draw us into a richer spiritual experience and understanding of God. Buckle your seatbelts…here’s where many Evangelicals and I part company: I do not think that the Bible was written as a scientific textbook. God never intended for the Bible to be the end-all resource for understanding geology, astronomy, archaeology, botany…the list goes on and on. The Bible isn’t about science – it’s about faith. The Creation narratives in Genesis are not about telling us the scientific method and model of God’s activity – it’s telling us THAT GOD HAD ACTIVITY! He created. Life in the universe has a point, a purpose, a reason for being. God did it. He created us to be people in relationship with him. He created us to be people of worship. That is the overwhelming story of creation. When we look at the Bible as a textbook we lose sight of the big picture of God’s activity and design for humanity. We get bogged down in the nitty-gritty details of the text and try to “figure out” how the text jives with empirical data. The truth is, it doesn’t matter how the empirical data lines up. Even if archaeology did not support the biblical narrative (yes, archaeology DOES support much of the biblical narrative) the science is not the point. You cannot move someone to faith through science. Science touches the head. Faith moves the heart. So, coming full circle, did God create dinosaurs? Probably. I don’t think the bones and fossils manifested spontaneously. 😉 Does it damage faith to believe in dinosaurs? Not one bit. In fact, when we learn to let go of looking at the Bible as a science textbook we are freed to expand our faith and see the mystery of God at work everywhere.